Salsa redesigns their long-travel 29er with Split Pivot rear suspension and enhanced geometry for tighter handling. 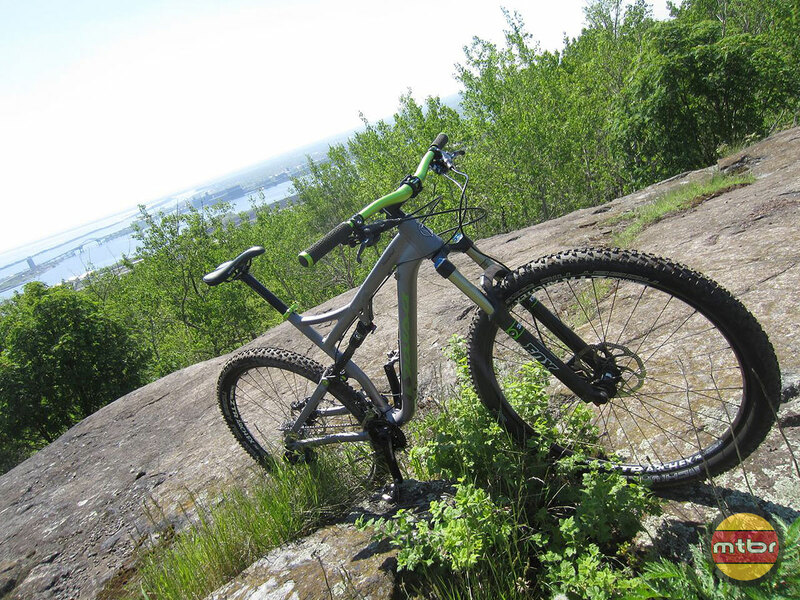 Horsethief 1 on the Piedmont Trails above Duluth. I’m beginning to think Salsa recruits its male employees from the NFL; either that or the logging industry. Several guys in the Salsa crew I hung out with in Duluth, Minnesota this past week are taller than six feet, weigh more than 200 pounds, sport healthy beards and have leathery handshakes that will crush anyone with a feeble grip. So it goes without saying that guys with these types of dimensions need as much beef in their bike as they do on their dinner plate. Enter the redesigned 2014 Salsa Horsethief – a burly-yet-agile 120mm full-suspension 29er featuring Split Pivot technology that feels as natural on the Enduro racing circuit as it does on tight, technical singletrack. Dave Weagle’s Split Pivot rear end is the nucleus of the new Horsethief. 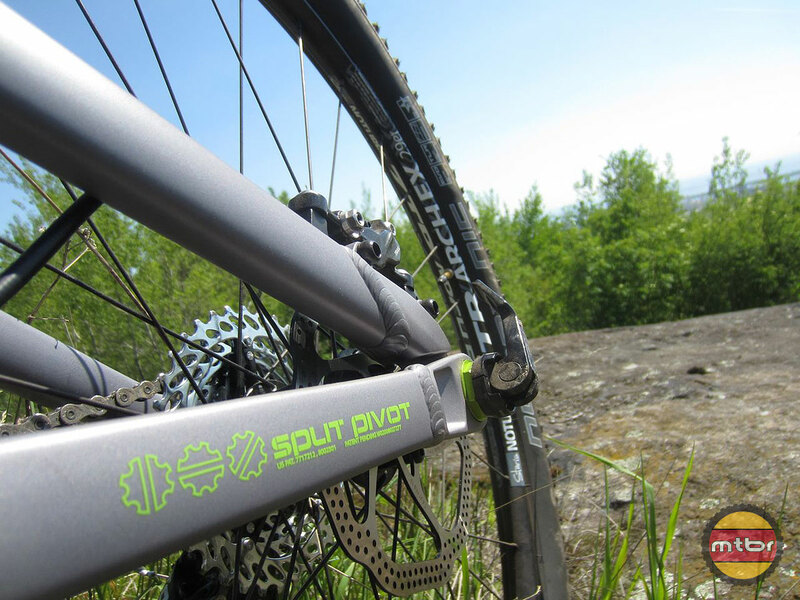 Split Pivot is an innovative rear suspension design pioneered and patented by David Weagle, also known for his World Cup Downhill-winning DW-Link design. When Salsa engineers sat down at the design table to enhance the Horsethief, instead of making up something new, they decided to stick with what they know works. So a phone call to Martha’s Vineyard was made, and DW was proud to partner up with Salsa in redesigning the Horsethief. Split Pivot also has outstanding anti-squat properties, meaning that the Horsethief rides higher under pedaling accelerations. In redesigning the Horsethief, Salsa engineers wanted to retain its rugged terrain capabilities while improving suspension efficiency and agility in corners. 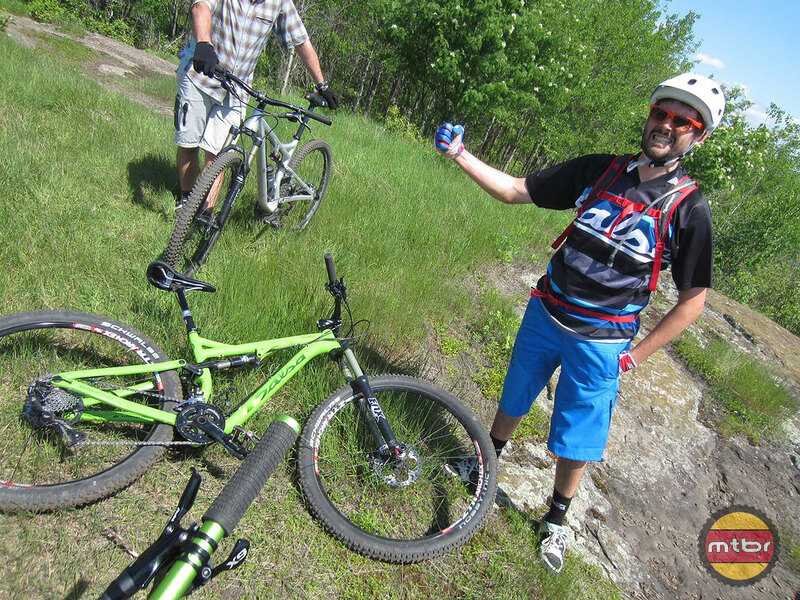 Dave Weagle spent all week on a Horsethief and seemed to love every minute of it. Besides incorporating Split Pivot, Salsa engineers increased rear triangle stiffness by using FEA-optimized AL-6066 tubing and a 12x142mm rear thru-axle for an impressive 18 percent improvement in lateral stiffness. The redesigned rear triangle can also accommodate tires as large as 2.4 inches. To dial in the cornering agility of the Horsethief, exceptionally short 437mm chainstays are features on all frame sizes (S, M, L, XL) – among the shortest chainstays of any full-suspension 29er. A very relaxed 68.1 degree head tube angle paired with a 51mm offset Fox fork help the Horsethief track straight and confident at speed yet still enable it to carve tight turns with the agility of a full-suspension bike with 26” wheels. Every Horsethief BB92 bottom bracket and tapered head tube are factory-faced and reamed after being painted, an extra step to ensure quality and precision that most other manufacturers neglect. Other little details like added cable holders for dropper posts and moto-style brake orientation help make setup cleaner and easier. Due to its shorter chainstays, the Horsethief is set up for 1x and 2x drivetrains only. Continue reading for Horsethief riding impressions, more information and full photo gallery. My one question is how does that yoke on the shock attach to it? Can it be bolted to the end of a stock shock, or is it proprietary like Specialized thus making upgrades only available through Salsa? The lower mounting hole on the shock is rotated, the bolt is vertical instead of horizontal. The new ibis ripely uses the same concept. Nothing proprietary about it. This new horsethief looks so badass! So happy I waited out for the new model. I almost pulled the trigger on a ’13, this looks so much more refined and even more capable. Well done Salsa! Is it offered as a frame only option? If so hoswmuch is the frame? Yes, frame only option I believe is $1600, same price as Spearfish. I think you meant to say the Horsethief XX1. It seems like all the new 2014 mtb FS bikes try to copy the geometry of the Trailbike of the year 2013. The English Whyte T129 S was the first with slack 68 degree headangle and chain stay of only 43 cm. It worked. Now we see all the copy cats. But T129 is still cheaper, including a stealth dropper post.